We have always been advocates of the humble home sections at our local supermarkets but who knew that they were also awesome places to pick up last minute Christmas gifts? Need to replenish the cranberry sauce stocks? Pick up a bottle of luxury gin for your dad at the same time. Run out of Advocaat? Oh, look, there’s a light up flamingo that would be great for your flatmate! And the best thing is, supermarket Christmas gifts are all pretty cheap – perfect if you are Christmas shopping on a budget! The perfect gift for your home loving friend who will never know you actually picked up this super on-trend glass terrarium while shopping for cat food and mulled wine in Asda. The perfect gift for any neon, unicorn, flamingo or rainbow loving teen, George Home’s range of LED lights is sure be a welcome addition to any drab uni bedroom (ahem, not so drab with our uni bedroom essentials, if you don't mind). Want more inspiration for those tricky to buy for teenagers? Check out our gift guide for teens. Move aside unicorns, llamas are apparently the next whimsical animal trend. And what better way to introduce the llama trend into home decor than sticking a cactus on its back and calling it a planter? In all seriousness, these little llama cactus holders from Asda are very endearing and definitely fit that boho vibe we are seeing everywhere at the moment. Distilled in small batches, this passionfruit gin liqueur from Aldi is fruity, rich and is sure to make for some delicious Christmas cocktails. We’ll take five. We all love a Christmas scented candle, and this cedarwood and spiced plum number from Sainsbury’s is no exception. The warm fruity tones mixed with the earthy notes are like a mulled wine by the fire in a jar. And on the subject of the jar, it’s so lovely it could definitely have a second life as some cute bathroom storage. Yes, this is a Polaroid camera for only £69.99 from Aldi!! Plus it comes with 20 free shots. You may as well just stop trawling through gifts guides now, we think we just found you the best bargain Christmas present out there. And on a related subject... we have tons of gifts for keen travellers, too. It’s a mug in the shape of a whale. Need we say more? Apart from maybe that it's only £3.50 from George Home. The branding might look ahem... familiar, shall we say, but these dupes offer all the luxury without the massive price tag. These Aldi body lotions come in an array of, again familiar, scents including Pomegranate and Lime, Basil and Mandarin and prices start at only £2.49! P.S. Tons more beauty gifts can be found in our buyer's guide. You just can’t go wrong with a lovely cheeseboard, because who doesn't love cheese? The simplicity of this Sainsbury's oak chopping board definitely has a Scandi feel about it and looks way more expensive than the mere £16 it’s priced at. 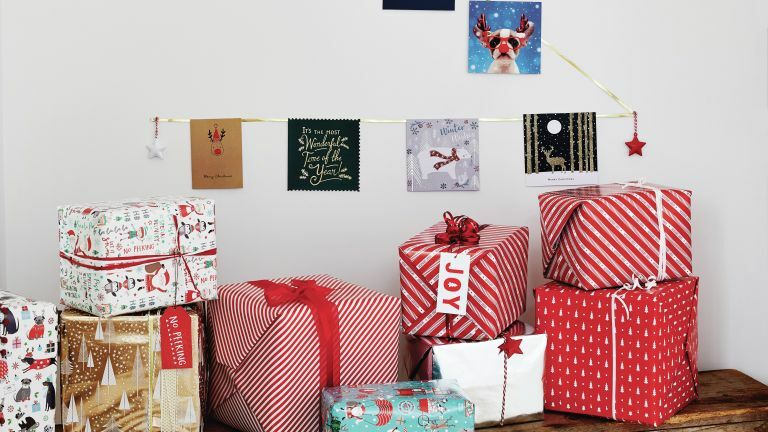 By the way, we've got tons more foodie gifts and decoration ideas for a Scandi style Christmas. This chocolate coffee scrub from Aldi is 97 per cent natural and it’s vegan friendly! Coffee, chocolate and a guilt free conscious? What’s not to love. And if you are looking for more beauty gifts that you can't pick up in the toiletries' aisle, be sure to check out our guide. Ocado counts as a supermarket right? Okay good, because you can find some lovely gifts while you order your Christmas caviar, like this letter board in a gloriously minty green shade. And these patterned mini planters! Perfect if you are buying for a style conscious gardener. Hampers make for such lovely gifts but once you've bought the perfect rustic basket, a bottle of fizz and some fancy French cheese, they can get pretty pricey. Enter Aldi. This year, they have some incredible hampers starting from as little as £24.99! The Exquisite Hamper is a bit of treat but it would be a stunning gift for a foodie who loves the finer things. Rest assured that whoever you buy this for will wonder how they ever lived without a silver penguin shaped cocktail shaker. Bow-tied, tuxedo-ed and stately in stainless steel, this guy has got to be the most dapper thing on Morrisons' shelves. Find more classy cocktail shakers in our buyer's guide. Lidl has just launched a Christmas gin for this year and boy does it sound delicious! Their Spiced Plum and Cinnamon Gin Liqueur has been market as an alternative to mulled wine so you can actually drink it warm or over ice with tonic. The bottle looks almost as beautiful as its contents taste, and you would never guess it costs just £11.99. It's only available in store, so pick one up next time you are doing your weekly shop. The perfect stocking filler for anyone who enjoys a good cocktail (so basically everyone right?). You can pick up this Moscow Mule set from Sainsbury's for just £15, so you could always head to the alcohol aisle too and pick up some vodka and fancy ginger beer to give the whole works. Waitrose has a very impressive beauty section, and to our surprise stock some of our fave luxury brands. This gorgeous little gift set from Tisserand would make a lovely secret Santa gift or a stocking filler. It contains three pulse point roller balls made with 100 per cent natural pure essential oils – Breathe Deep is made up of a blend of orange, petitgrain and coriander which instantly relaxes; True Comfort's blend of bergamot, cardamom and ylang ylang wraps you in a blanket of serenity; and Sleep Better is made up of jasmine, sandalwood and lavender to encourage an even deeper sleep. Sounds dreamy, no?